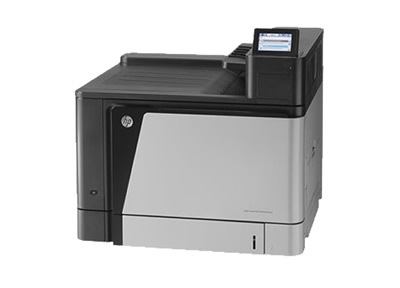 In Short: The HP Color LaserJet Enterprise M855 series is Hewlett Packard’s 11X17 network color laser printer intended for medium print volume. The M855dn setup is straight forward as it physically looks just like an oversized M651. Most of the supplies including the four toners and drums load from front of the machine. 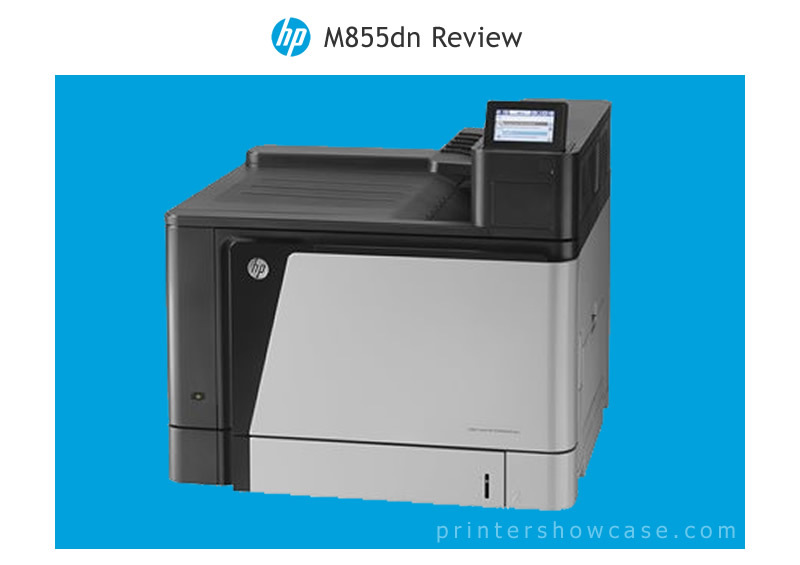 The HP M855dn is rated at up to 45ppm in color or black and white which is average among this group of printers. The HP Color LaserJet M855dn has a maximum resolution of 1200X1200dpi and produces great looking output in both color and black and white. In general The HP M855DN printouts are fairly color accurate and high resolution images are sharp. The HP M855dn ships with one 500-sheet paper feeder that can handle up to 11X17 and a 100-sheet MP tray which can feed 12X18. Both sources are limited to a maximum paper weight of 220g/m2. Additional feeders are available or you can go with the M855xh configuration which will have the maximum four 500-sheet feeders and an internal HDD (not available for the M855dn). Both versions include fast Ethernet, PCL, PostScript3 emulation, and 1GB of RAM. The Bottom Line: The Hewlett Packard M855 series is a high resolution 11x17 capable color laser printer for medium volume applications. 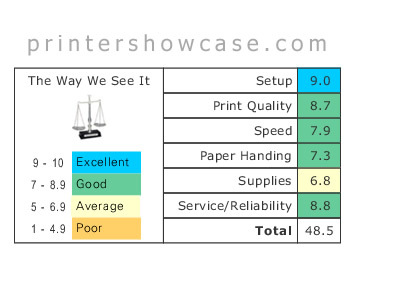 Overall it’s a good performing printer that does what it says. However, the high supply costs make it less attractive for significant volume use and the big initial price tag of the machine itself seems unjustified to us considering other better performing printers available in this price range. The M855dn works well with most all recent versions of Windows and Mac OS.The M855 works well with most all versions of Windows and most recent Mac OS versions.